You might have heard that the charge always lies on the outer surface of a conductor. If there is a cavity inside a conductor, we can also prove that the charge always lies on the outer surface of the conductor. A conductor with a cavity is shown in Figure 1. The conductor initially has charge $+q$ and in electrostatic situation, that is charges not in motion, the electric field inside the conductor should be zero. 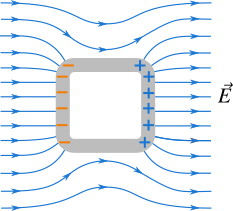 Figure 1 The charge $+q$ inside the cavity insulated form the cavity surface induces negative charge surrounding it and therefore the charge $+q_i$ is added to the charge on conductor's surface. Now we put charge $+q$ inside the cavity insulated form the conductor. The charge $+q$ induces charge $-q_i$ around the cavity surface and again the electric field inside the conductor is zero. The additional $+q_i$ charge is added to the charge on the conductor's surface. Now the conductor has charge $q+q_i$. Note that the subscript $i$ represents the induced charge. Since in electrostatic situation, there should not be any electric field inside the conductor and hence no charge (using Gauss law) and the additional charge is added to the conductor's original charge. We test this with Gauss's law. Make a Gaussian surface like the one shown in Figure 2. 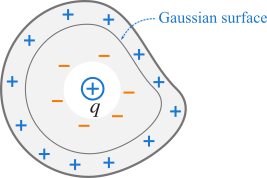 If the electric field inside the Gaussian surface is zero, the net charge enclosed by the Gaussian surface is also zero. If the excess charge try to go to the inside of the conductor there would be electrostatic interaction between the excess charge and the free electrons within the conductor which results in the motion of the excess charge but the excess charge ultimately remains at rest and for this reason the outer surface is the best place to go (electrostatic situation). Now we determine the electric field at the surface of a conductor. The electric field is radially outward at every point on the conductor's surface; it means the electric field is perpendicular to the conductor's surface. If the electric field has any component parallel to the surface, then we need to explain why it has that component. Also that component affects the electrostatic equilibrium. 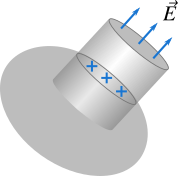 Make a Gaussian surface as shown in Figure 3 which is a cylinder and let the surface charge density of the conductor be $\sigma $. Figure 2 The electric field of a charged conductor is perpendicular to the surface of the conductor. This is the same expression as that of between two oppositely charged parallel plates. When a metal box like in Figure 3 is placed in a uniform electric field, the field induces charge in the box and the induced charge produces an electric field opposite to the applied field. The applied field draws negative charge towards it and pushes the positive charge away form it. The applied electric field is cancelled by the induced electric field and the net field inside the box is zero. Such a box is also called as the Faraday cage. Figure 3 Faraday cage; saves you from lightening and other electric discharge, is a metal cage. The electric field inside the cage is zero and the charge always tends to lie on the outer surface of the cage. The Gauss's law tells you that when you make a Gaussian surface just inside the boundary of the metal cage and the electric field is zero, the charge inside the Gaussian surface or within the metal cage is zero. This also concludes charges lie on the outer surface of a conductor. An example is a car during lightening, the safest idea is to stay inside the car during lightening. If the car got a lightening, the charge remains on the outer surface of the car and zero or very little electric field is produced inside the car. In this case the car becomes some kind of a Faraday cage. This effect is called electrostatic shielding.